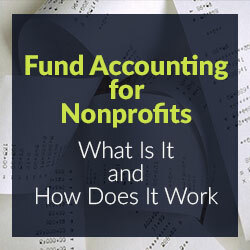 The concept of fund accounting is one of the main differences between for-profit and nonprofit accounting. Its name comes from the fact that revenues and expenses are segregated in the accounting system into “funds” for the purpose of tracking each fund separately – primarily for reporting purposes. As opposed to for-profit organizations which focus on profitability, nonprofits use fund accounting to focus on accountability, and the use of separate “funds” with their own ledger allows nonprofit organizations to more easily assess each fund individually. Depending on the nonprofit, a separate fund is typically established for each of the organization’s various programs as well as its overhead, general administrative, and fundraising activities. To track such revenues and expenses separately, the organization will set-up in the fund accounting system and assign to these transactions a unique fund code. In most cases, the fund code will contain a string of unique identifiers – such as a code for the donor, grant, project, location, and so on. Depending on the organization, this code string may go by different names – a budget code, project code, cost center, or similar. But despite the nomenclature used by the organization, these identifiers essentially serve the same purpose — allowing the accounting staff to easily run queries and generate reports in the accounting system by any value in the code string. An added benefit of fund accounting is that, by tracking revenues and expenses separately for each fund, organizations can easily see how donors’ funds are being spent. This is essential not only for the purpose of easily developing financial reports for those donors who require them as part of their grant agreement, but also for the purpose of tracking fund restrictions and generating accurate financial statements. For example, if an individual donates money to a nonprofit organization and limits how the organization can use the funds, that money is considered restricted solely for that purpose. When these funds are recorded in the fund accounting system, the accountant must designate whether the donated monies are restricted and assign the monies to a given fund code. As the organization spends the donated monies on the purpose for which they are intended, the revenues associated with these expenses are no longer restricted, and the corresponding revenues are reclassified from the restricted net asset account to the unrestricted net asset account. Thus, at any time, the accounting staff can easily determine, based on the expenses assigned to each fund, how much of a donor’s money is remaining and how much of the organization’s net assets is categorized as restricted versus unrestricted. Of course, fund accounting does not only benefit the accounting staff, but also program managers who rely on such financial information in order to appropriately monitor their program’s resources. By segregating revenues and expenses into separate funds, the accounting staff can more easily provide programmatic staff with updated spending information, budget variances, forecasts, burn-rates, and pipelines, as well as monitoring program spending against donor-imposed restrictions (such as restrictions on budget line-item flexibility) – all of which is essential to program managers and to ensure overall programmatic success. Given the unique role of nonprofits in our society, there is understandably a focus on an organization’s programs and its programmatic outcomes. But there is also a strong need for nonprofits to monitor the availability of funds that are designated for each individual program. Doing so helps the organization see where funds are being spent and where the organization should focus its fundraising activities. It also allows nonprofits to individually assess programs for effectiveness and efficiency. And the use of fund accounting is essential to nonprofits in achieving these objectives.